Again, for the ninth year, we are participating with the American Cancer Society’s Daffodil Days. Now thru February 20th, you can preorder a Ray O. Hope 10 inch Boyds Bear with a bunch of 10 daffodils for $25.00 or a bunch of 10 daffodils for $10.00. You can stop by the store, call on the phone or let us know right here that you are interested in preordering. Each year we ship out a few bears to folks in areas that cannot get them locally. All donations go directly to the American Cancer Society. 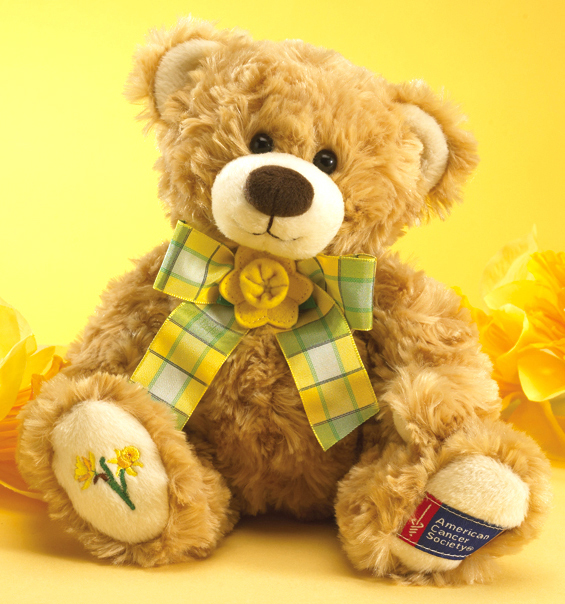 Boyds Bear by ENESCO continues to design an exclusive bear for The American Cancer Society’s Daffodil Days. Bears and daffodils will be available in mid-March. Take a peek at this cutie . . .
A 10-inch Ray O. Hope Boyds bear by Enesco, the ninth in a special Boyds™ Bear collection designed exclusively for the American Cancer Society Daffodil Days Bear and a bunch of daffodils, $25. A stylish etched glass carafe and a bunch of daffodils, $15. Potted mini daffodils: Three to four daffodil bulbs inside a foil-wrapped 4-inch pot, $12. You can also deliver an anonymous Boyds Bear to a child in need in your community with a $25 donation to Project Care, or an anonymous bunch of daffodils to a local cancer patient with a $25 donation. Preorders are due Feb. 20; daffodils will be available March 18-24, 2013.